Because we did not have far to ride today, we had a nice sleep-in to 6am! The ride into Broome was over the gradual ups and downs of old sand dunes. We arrived in town shortly after 11am and found a café with lots of shaded tables outside and ordered coffee and cake for morning tea. 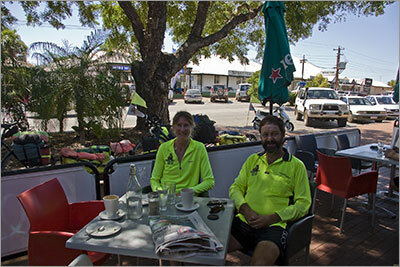 We sat down with the realisation that we had just completed riding our bicycles across Australia from Cairns to Broome! 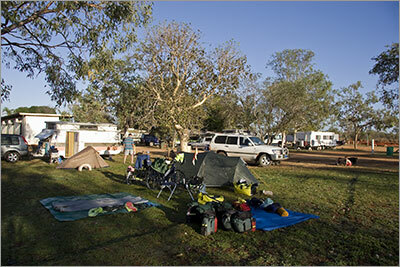 As we sat enjoying our morning tea, several caravanners we had met over the past few months came up to us to say hello. Morning tea turned into lunch and just as we decided to head for our B & B we met Cyril from Switzerland who was also cycling from Darwin to Perth. We had booked the B & B for three nights, but after our time in town this morning we decided that five nights would be more refreshing. 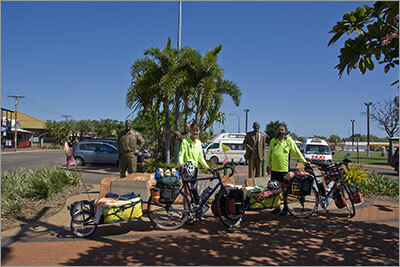 We made it to Broome having crossed the country by bicycle. Denise and I in front of the Cultured Pearl and Hard Hat Diver Monument. 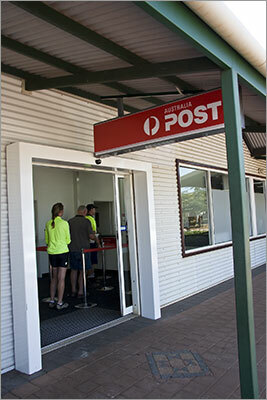 Denise queuing for our mail.